#12 - [EPIPHANY!] How To Get Facebook Ad Results … FAST! #12 - [EPIPHANY!] How To Get Facebook Ad Results … FAST! Ep 12. – [EPIPHANY!] How To Get Facebook Ad Results … FAST! They boil down to three things: 1) Time; 2) Return on Investment (ROI); and 3) Figuring out the Facebook ad platform itself. Right? You’d want to know what it was, right? 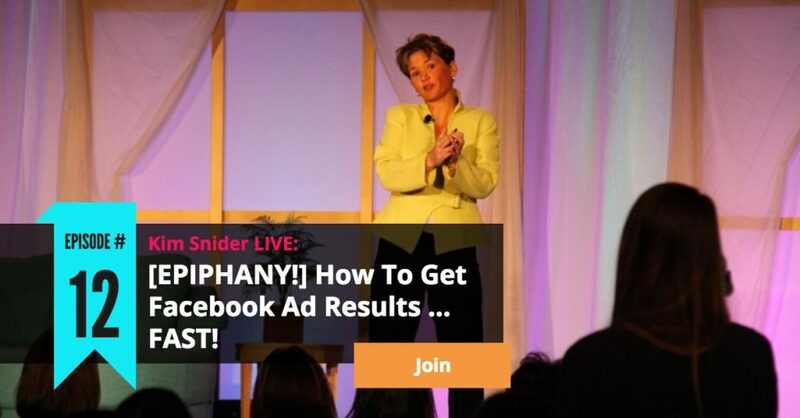 If so, join me for this Episode of Kim Snider Live, where I will explain my big Aha! I’ll explain why the top-down funnel everyone is teaching is your problem, not the answer. I’ll explain why the reverse funnel makes so much more sense. And, I’ll show you where there is money just hanging around waiting to be picked off like ripe fruit hanging from trees. 1:45 – Topic Introduction: How to get Facebook Ad Results and solve the issues of Facebook! 2:48 – Kim shares her epiphany on Facebook Marketing! 6:28 – The Top Down Funnel is only as effective as the degree to which you have it built out, tested and optimized. 9:54 – There are instant results with very little time and money by turning the funnel upside down. 10:40 – What is the reverse funnel? 12:05 – Kim shares what her funnel looks like. 22:10 – The systematic way of tackling and implementing a task each week. 25:33 – Bonus screenshots of Kim’s Active Campaign and Facebook campaigns in the cheat sheet! 28:54 – Kim answers the questions from the live broadcast! 30:10 – What is evergreen? 31:42 – Kim’s thoughts on a CTA button on an initial ad. 37:12 – The best way to use a deep dive survey. 46:24 – How does Facebook Live boost relevance score? In this week’s Episode #12 Cheatsheet, I have rounded up all the notes, links and resources from the broadcast PLUS screenshots of the sample targeting in both Active Campaign and Facebook for the simultaneous ad and email campaigns, so you can see exactly how you would do that. To download the cheatsheet, click the button below.